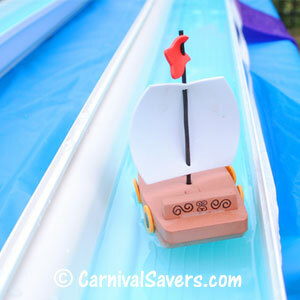 Rain Gutter Regatta - School Carnival Game Idea - Toy Boat Races! 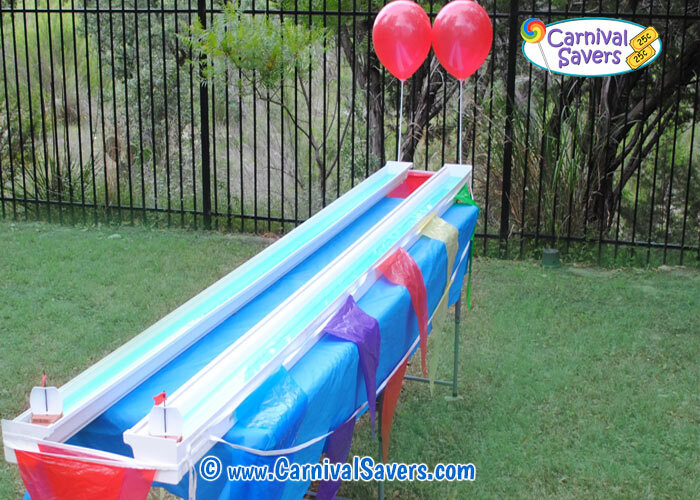 School Carnival Game Idea – Rain Gutter Boat Races! Kids Blow on the Boat Sails to Race down the Gutter. Balloon Sticks with Red Balloons make a Finish Line. Days before the carnival, seal the ends of each rain gutter with the end-caps and water proof glue, allowing plenty of time to dry! To setup this game, you will need a flat surface. Set up your table(s) and place your rain gutters a few inches from the edge of the table as show in the photo. Fill each gutter with about 3 gallons of water. Use a small amount of blue food coloring (optional) to add a slight blue color to the water if you wish. We decorated using flag pennant decorations and 2 balloon at the finish line taped to the end of each gutter on a balloon stick - now off to the races! You need 2 carnival players each time to make this game fun! 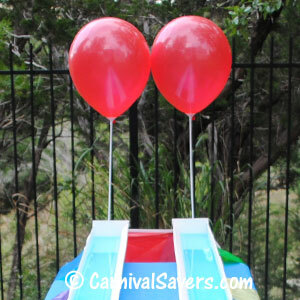 Carnival players are given a straw and stand at the one end of the gutter with their sailboat ready to go. The carnival volunteer says "On your mark, get set, go!" On "go" the players try to blow on the sail of their boat to move it down the gutter as fast as they can. The goal, of course, to be the first to hit the other end of the gutter and be the winner of the boat race! The winner gets the winners prize, and the loser will receive a consolation prize. 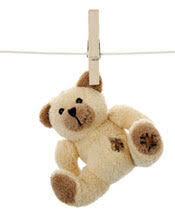 If there is a tie, you can give each player a consolation prize. Because you will almost always have a winner on this game, the winners prize is generally considered a medium priced prize (something around $25 - $35 cents) and the consolation prize can be worth less - see our examples below. Most of the fun of this game is just playing - so you can save your big prizes for some other games! Kids can "race the clock" as well as of each other. You will need two volunteers with stop watches (or smart phones with stop watches). At "Mark, Set Go" volunteers time the racers and at the end of the race, keep a written list of the players names and times. Once every 30 minutes - a volunteer will update the "Leaders Board" and show the fastest 10 players! The last 30 minutes of the carnival, they award the top 5 (or 10) times with a top prize - or even ribbons etc. All players receive a small consolation prize just for playing! Note: You need a very FLAT space to host the game! If in doubt, try it out first. The ground must be level or the boats will not have enough water to float the entire length of the game! We propped up one end of our table with flat rocks to make it level - you could also use cardboard folded over. 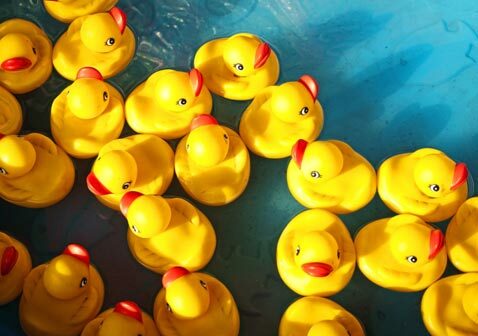 SUPPLIES & PRIZES for this FUN BOAT RACE CARNIVAL GAME!